A method for controlling an industrial automation device or process comprising a control unit at least one actuator and at least one device arranged for wireless communication with the control unit. The method determines characteristics of the wireless transmissions used to communicate sensor and/or actuator data to the control unit. The method, system and graphic interface enable a user to select a control strategy dependent on a value or values of the characteristics of the wireless communications. The present invention concerns a control method and a system for controlling an industrial automation device or industrial process, The invention relates to control systems in which one or more communications are carried out wirelessly for one or more data signals and/or control signals. Process control for industrial automation processes or industrial automation devices is often supervised and regulated by a process control system such as a closed loop control process. A traditional approach in the use of closed loop control is to measure a value of a process output and compare the measured value with a reference value. There are also other objectives of control loop control, including set-point regulation, tracking (time- varying reference path) , path following (varying reference independent of time), disturbance attenuation etc. When used as an input for a in a feedback control loop, any difference between the measured sensor value and the reference signal is fed into the controller. The controller then in turn sends signals to the actuator so that the reference value is approached. 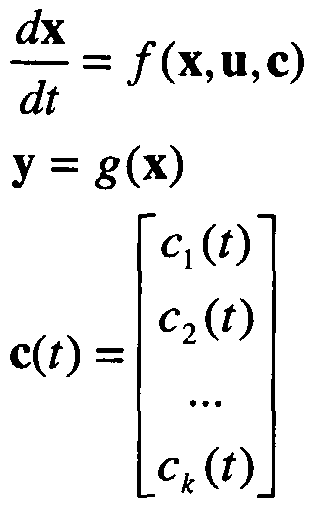 y = g(χ) where x is the vector of all state variables including time derivatives to any order of x, y is the output vector, u is a vector of the inputs, t is time, f and g are functions representing the system. Over time the difference between the value of the output measured by sensor 8 is expected to approach zero. Time delays and other constant feedback effects are not modelled in the above model, but may also occur between the actuator and the sensor. Such disturbances are not included in the above exemplary model but would be present in a real system. The traditional closed loop feedback system comprises hard-wired communication links. A disadvantage with hard-wired communication links is that changes in position of any component in the closed loop, such as a sensor or actuator, usually requires a stop in production or an extensive shutdown, especially in the case of analogue wired connections, and/or digital wired connections. Alternatively, such changes have to be delayed until a process shutdown may be programmed. In addition, hard wiring may be both expensive to replace and sometimes technically challenging to replace. The addition or removal of components in a control loop may demand interruptions in production or even a shutdown to implement when hard wired control lines are in use. Wireless communications have been used within industrial systems and standards such as IEEE-802.11 have been shown to be sufficiently robust for many industrial environments. However, wireless communications are more subject to dynamic variations and disturbances than hard-wired or optical networks. A primary aim of the present invention is to provide additional information for use in identifying a control strategy to use to control an industrial automation process. A secondary aim of the present invention is to provide additional information for use in identifying a control strategy to use to control an industrial automation device. Another aim is to provide additional information for use in a process control system to better improve control over the process and/or device. The above and more aims are achieved according to the invention by a method according independent to claim 1, and a system according independent to the independent system claim that incorporates use of the method. According to one aspect of an embodiment of the present invention, a method is provided for controlling an industrial automation device or process comprising a control unit, at least one actuator and at least one device arranged for wireless communication with said control unit of said process, which comprises determining at least one characteristic of a wireless transmission, statistically processing the at least one characteristic and supplying an estimated value for correction to said control unit, and selecting a control strategy dependent on the value or values of the at least one wireless communication characteristic. According to another aspect of an embodiment of the present invention, a method is provided for controlling an industrial automation device or process by implementing in a control unit of the device or process a control strategy dependent on an optimization of parameters of the communication channel by means of a logical or arithmetic model or process based on any from the list of: rule based model, state estimator, Kalman filter, deductive reasoning. According to a further other aspect of an embodiment of the present invention, a method is provided for controlling an industrial automation device or process by reading one or more of the characteristics of a wireless communication between a sensor and/or actuator a control unit of the process from a communication layer of the wireless communication. According to a further other aspect of an embodiment of the present invention, a method is provided for controlling an industrial automation device or process by reading one or more of the characteristics of a wireless communication between a sensor and/or actuator a control unit of the process from a MAC layer (medium access control) and/or a physical layer of the wireless communication. Closed loop control is often carried out by determining an output value from a process and, depending on the objective comparing the measured or otherwise determined value to a reference value. The difference between the reference signal and the measured sensor value is fed into the controller. The controller then in turn sends signals to the actuator so that the reference value is approached. There are of course several possible objectives of control loop control. Set-point regulation, tracking (time-varying reference path) , path following (varying reference independent of time), disturbance attenuation, etc. The quantity to be controlled can be the measured output or state, an unmeasured state, or combinations of measured, unmeasured states and the control variable. In a control system according to the Prior Art, all communication is typically hard-wired, and the quality of communication does not normally become an issue in the absence of extreme conditions and/or damage to wiring. However when one or more communication links are carried out by a wireless means, the quality, and/or robustness of the communication may be a technical concern. The method according to an embodiment of the present invention concerns monitoring the wireless communication taking place in a controlled process and feeding back information to the controller, which information may be incorporated in a control action, for example by means of the control algorithm. Information that may be included may be dependent, for example, on: packet loss, delay, delay variance. This means that information may be taken directly for example from one or more communication layers, and trends in the communication parameters can also be included. This information can as well be time-varying. In this description the concept of a comparator includes a comparator that identifies the differences between the desired behavior (for example a reference value, a trajectory, trend or path) and that of the system based on the relevant performance criterion. The comparator and the controller block may be comprised in one and the same module. The principal advantage of the invention is that monitoring of the wireless communication provides additional information that may be used to improve process control, and/or control of one or more industrial automation devices. More information is thus provided to control processes and/or devices without adding dedicated sensors or measuring means, but only by extracting information from existing sources in a new and inventive way, then processing the information, and applying it in a selected way. FIGURE 6 is a schematic block diagram for a graphical user interface for displaying and/or manipulating methods according to another embodiment of the invention. Figure 2 shows a schematic diagram for closed loop control of an industrial process including one or more wireless communication links. Figure 2 shows a closed loop feedback control Ia similar to the Prior Art example shown in Figure 1. Figure 2 shows one or more communication links, one link 7w from sensor to control unit 4 and a link 9w between control unit to actuator 6 implemented as wireless links. One or more actuators 6 and one or more sensors 8 may be comprised in a process comprised as system Ib or subsystem Wireless link 7w and/or 9w are monitored and communications parameters collected at 15 are sent to the control unit 4. Wireless link 7w, 9w may be monitored and the resulting information sent to control unit 4.
where the vector c consists of k communication elements (parameters) CJ_. The communication parameters are monitored by reading information comprised in different ways in the wireless transmissions. Much of the information may be obtained from a MAC (Medium Access Control) layer of, for example, an IEEE 802.11-type protocol for wireless communication in an Ethernet type LAN, or from an IEEE 802.15.4 wireless network system. The information available from such a MAC layer may comprise the following parameters : -RSSI received signal strength indication -number of failed transmission attempts -network occupancy. Other communication parameters are monitored as such and not read or obtained from the wireless transmission Medium Access Control. These are parameters such as : -transmitter power use variation -receiver power use variation. Parameters from the immediate environment of the wireless node may be collected for analysis and control purposes. For example an update rate for a wireless sensor, and/or variations in the update rate, may be logged as a parameter and evaluated. 49 generating, in a controller, control signal outputs. In this way an estimator or other control strategy may be selected and used to provide a good estimate for a predictive correction in a control loop, the selected control strategy control strategy may be selected and used to provide a good estimate for a predictive correction in a control loop, the selected control strategy depending to some extent on the nature of the information derived from the data gained from the wireless transmission characteristics. Dead reckoning (or deductive reasoning), a Kalman Filter, Neural network or similar may also be used to provide a correction factor for the control loop to identify disturbances and/or to eliminate a process error. Thus control, for example, of an actuator 6 as shown in the schematic control loop of Figure 2 may be carried out by corrective action based on parameters of wireless communication between the control unit and the actuator and/or by corrective action based on parameters of wireless communication between the control unit and a sensor cooperating with the actuator. A type of rule-based model also may be used. For the purpose of developing an adaptive estimator, one or more neural networks may also be trained either off line or on line, depending on the situation and the data intensity with respect to data handling capacity, and/or computing requirements. The application of neural networks can as well take place together with the mathematical and/or physical process models, as a relative neural network. As well or instead neural networks may be used to model one or more technical processes or assumed technical processes that have, for example, not been captured in a mathematical and/or physical process model, an application which is sometimes known as absolute neural networks. On-line training of neural networks may be particularly useful when it is relevant to determine a "Monday morning" syndrome, i.e. variation due to a plant re-starting after an idle period, or another kind of "daytime state" which may occur in an industrial plant, in order to adapt the automation system to this or these states. The training is carried out on the basis of measured characteristics logged on line which may be directed into an optimization of the type described here of parameters and/or process models. An optimal or other preferred adaptation of a mathematical and/or physical process control strategy may also be achieved by means of genetic algorithms. It is possible by means of stochastic mutation of various approaches to a solution to use these evolutionary algorithms to identify preferred or optimum parameter settings for certain process control models. In addition it is possible to add to this process by means of genetic programming. With the aid then of an evolution type of control strategy, it is possible to achieve structural improvements to the device or process control. One or more of the sensors or actuators or other components is equipped with a wireless transmitter, and wireless communications between for example the sensor and a control unit of the industrial process may be carried out using any suitable protocol such as wireless Ethernet, ZigBee or another wireless networking or WLAN protocol. Suitable transmissions may be made using a short-range radio communication, such as a transmission conforming to a protocol compatible with any of: standards issued by the Bluetooth Special Interest Group (SIG) ; any variation of IEEE- 802.11, WiFi, Ultra Wide Band (UWB), ZigBee or IEEE-802.15.4, IEEE-802.13 or equivalent or similar. A standard compatible with WAPI (WLAN Authentication and Privacy Infrastructure, GB15629.11- 2003 or later) may advantageously be used in situations where encryption of the wireless signal is necessary or advantageous. A radio technology working at high frequencies usually greater than 400MHz, for example an ISM-type band (e.g. 433MHz, 868MHz, 2.4GHz, 5GHz or higher), with significant interference suppression means by spread spectrum technology or frequency hopping and so on may be a preferred type of wireless communication. For example a broad spectrum wireless protocol in which each or any data packet may be re-sent at other frequencies of a broad spectrum at around 7 times per millisecond, for example, may be used, such as in a protocol developed by ABB called Wireless interface for sensors and actuators (Wisa) . One or more microprocessors (or processors or computers) comprise a central processing unit CPU performing the steps of the methods according to one or more aspects of the invention, as described for example with reference to Figures 3-7. The comparator may be comprised as a processor, or it may be comprised as a standard computer or processor or other device or a dedicated analogue or digital device or on one or more specially adapted computers or processors, FPGAs (field programmable gate arrays) or ASICs (application specific integrated circuits) or other devices such as simple programmable logic devices (SPLDs), complex programmable logic devices (CPLDs) , field programmable system chips (FPSCs) . The method or methods, such as those described in relation to the figures, especially to Figures 4-7, are performed with the aid of one or more computer programs, which are stored at least in part in memory accessible by the one or more processors. The computer program comprises computer program code elements or software code portions that make the computer, processor or other device perform the methods using equations, algorithms, recursive algorithms, wireless communications parameter data, stored values, calculations and statistical or pattern recognition methods previously described, for example in relation to Figures 2, 4-6. A part of the program may be stored in a processor, but also or instead in a ROM, RAM, PROM, EPROM or EEPROM chip or similar memory means . The program in part or in whole may also be stored locally (or centrally) on, or in, other suitable computer readable medium such as a magnetic disk, CD-ROM or DVD disk, hard disk, magneto-optical memory storage means, in volatile memory, in flash memory, as firmware, or stored on a data server. Other known and suitable media, including removable memory media such as Sony memory stick (TM) and other removable flash memories, hard drives etc. may also be used. The program may also in part be supplied from a data network, including a public network such as the Internet. The computer programs described may also be arranged in part as a distributed application capable of running on several different computers or computer systems at more or less the same time. Methods of the invention may also be practised, especially for example during a configuration phase, to examine events or to adjust set-points, or following a stoppage, or during normal operations by means of a Graphical User Interface (GUI) . This is a graphical display on an operator workstation, running on a user's logged-in computer, portable computer, combined mobile phone and computing device, wearable computer or PDA etc, which may also comprise one or more text input lines or fields. Such a logged in computer may be connected directly to the control system, or connected via a main or local control server, or other control unit even such as a simple controller or PLC, or via a control system computer/workstation. 57 Outputting the estimator output or outputs to a control model, 59 generating, in a controller, control signal outputs. Figure 7 shows a schematic arrangement for a graphical user interface for displaying and/or manipulating methods according to another embodiment of the invention. It shows a graphical user display 70 comprising elements representing actuators 76, one or more parts of an associated system 71b, and one or more sensors 71. The GUI also comprises graphically manipulatable means 81, 83- 89 to select or configure information relevant for adjustment or correction of one or more parameters control loop Ia. The figure shows representations of the one or more actuators 76, a system 71b related to the control loop 61a and one or more sensors 71. Activating the actuators representation may provide access to set points 81, or other control loop parameters that may be corrected, or to e.g. configuration data. Activating the System representation may provide access to one or more control actions 83, data on system trends 84, data on a trend of the control loop 86, or on a system disturbance 87, any of which may also be used to correct one or more parameters of the control loop Ia. The sensor representation may provide access to a configuration function 88 and/or signal/noise ratio information. In a yet further embodiment of the invention, the graphical user interface or other HMI may be embodied as a touch screen. In this case, text lines or images included in the display of a preferred embodiment, and means such as select estimator or input buttons, may be embodied as graphic images on a touch screen. Operation may be carried out according to the above method and as well executed by means of touching parts of the screen* instead^bf- pressing buttons, or by clicking with a computer mouse or other pointing/selection device. -selecting a control strategy dependent on the value or values of the at least one wireless communication characteristic. 2. A method according to claim 1, characterised by implementing in the control unit a control strategy dependent on an optimization of parameters of the communication channel by means of a logical or arithmetic model or process based on any from the list of: state estimator, Kalman filter, deductive reasoning. 3. A method according to claim 2, characterised by inputting information dependent on parameters of the communication channel into a neural network or for training the neural network. 4. A method according to claim 2 or 3, characterised by inputting information dependent on parameters of the communication channel into a process for determining a estimated value for a disturbance or an error correction based on Bayesian or Bayesian network logical or calculation model . 5. A method according to any of claim 1 or 4, characterised by -comparing the at least one characteristic to a predetermined value for the characteristic, statistically processing any differences between the determined characteristic value and a predetermined characteristic value, and supplying the differences to said control unit. 6. A method according to any of claims 1 to 5, characterised by reading one or more of the characteristics (15) from a communication layer of the wireless communication. 7. A method according to claim 6, characterised by reading one or more of the characteristics (15) from an access control member of a communication channel. 8. A method according to claim 1 or 7, characterised by reading one or more of the characteristics (15) from a medium access control layer (MAC) . 9. A method according to claim 5, characterised by reading from a MAC layer any from the list of: one or more of RSSI (received signal strength indication) , number of failed transmission attempts, network occupancy. 10. A method according to claim 1, characterised by reading one or more of the characteristics (15) from a physical layer of the wireless communication (13, 14) . 11. A method according to claim 6, characterised by reading information dependent on sensed carrier characteristics from a physical layer of the wireless communication. 12. A method according to claim 6, characterised by reading information dependent on transmission and/or reception of information containing members such as frames or packets. 13. A method according to any of claim 7 or 8, characterised by reading information dependent on any from the list of: packet loss, packet transmission time delay, packet reception time delay, packet failure rate, transmission time delay variation, reception time delay variation. 14. A method according to any of claims 1-13, characterised by- sending a test frame transmitted by a wireless node to one or more other wireless nodes for scanning purposes and reading information from other wireless nodes or access points dependent on the test frame to obtain information about signal strength. 15. A method according to claim 14, characterised by reading information from wireless nodes or access points dependent on the test frame sent and comparing that information with a service set identifier or similar. 16. A method according to claim 1, characterised by reading an update rate for a wireless sensor. 17. A computer program which when read into a computer or processor will cause the computer or processor to carry out a method according to the steps of any of claims 1-16. 18. A computer readable medium comprising a computer program which when read into a computer or processor will cause the computer or processor to carry out a method according to the steps of any of claims 1-16. 19. A graphical user interface for controlling an industrial automation device or process (1) which comprises at least one control unit (4), at least one actuator (6) and at least one device (6, 8) arranged for wireless communication with said control unit of said process, characterised by a graphical user interface (61) for displaying data relevant to a part of the control loop (1) , which said GUI comprises graphic user interface display and/or manipulation means for configuring a control strategy dependent on one or more characteristics of one or more of wireless communications (13, 14) . 20. A graphical user interface according to claim 19, characterised by a graphical user interface comprising graphical user interface manipulation and/or display means for configuring a reference value for comparison with any of the one or more wireless communication characteristics. 21. A graphical user interface according to claim 19, characterised by a graphical user interface comprising graphical user interface manipulation and/or display means for displaying a part of the control loop and a representation for one or more control loop parameters that may be corrected dependent on any of the one or more wireless communication characteristics. -memory storage means (15, 20, 4) for storing one or more characteristics of one or more of wireless transmissions (13, 14) , -statistical processing means for determining an estimate for a control strategy dependent on any of the one or more wireless communication characteristics . 23. A system according to claim 22, characterised by processor means for comparing any of the one or more characteristics to a predetermined value for one or more characteristics and calculating by a logical and/or arithmetic process a difference value from the one or more of wireless transmissions . 24. A system according to claim 22, characterised by processor means for comparing any of the one or more characteristics to a predetermined value for one or more characteristics. 25. A system according to claim 22, characterised in that said control unit comprises a wireless communication member. 26. A system according to claim 25, characterised in that said at least one sensor comprises a wireless communication transmission member. 27. A system according to claim 22, characterised in that said at least one actuator comprises at least one wireless communication receiver. 28. A system according to claim 22, characterised in that the wireless communication member is arranged for wireless communication which comprises at least one physical layer and at least one medium access layer. 29. A system according to claim 28, characterised in that the wireless communication member is arranged for wireless communication comprising a physical layer and a medium access layer compatible with an IEEE standard 802.11, 802.15.4 and the like. 30. A system according to claim 29, characterised in that the wireless communication member is arranged for wireless communication comprising a logical link control layer. 31. A system according to claim 22, characterised by comprising at least one software application or computer program for handling one or more characteristics of one or more of wireless transmissions (13, 14), according to computer program claim 17. 32. A system according to claim 22, characterised in that the memory storage means comprise a non-volatile storage means (2, 4, 20) for data storage for storing the one or more characteristics of one or more of wireless transmissions (13, 14) and/or differences or information derived from the characteristics suitable for data retrieval, for use in conjunction with a control action. 33. A system according to claim 22, characterised by at least one display means connected or connectable to the system comprising means to display a graphical user interface according to any of claims 19-21.